Prevents unwanted guests (Parasites) from climbing your birdfeeder or birdhouse post. D.E. has various uses as an anti-caking agent and parasite deterrent for livestock and birdhouses. 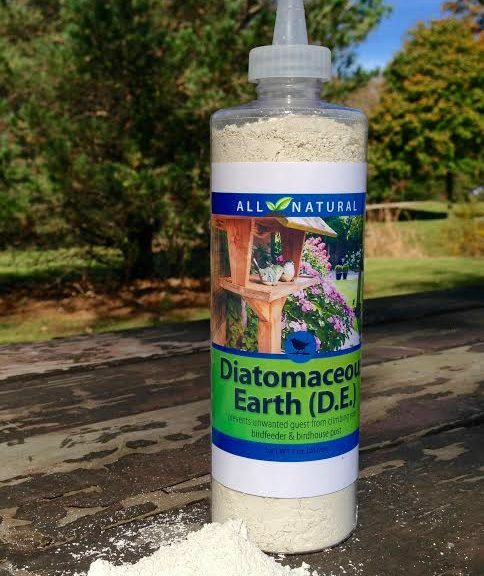 Our Diatomaceous Earth (D.E.) is an organic and all natural feed-grade product comprised of tiny fossilized water plants called diatoms (algae). D.E. is odor-free, tasteless, and has an indefinite shelf life if kept dry. Our feed-grade product should not be confused with Pool-grade D.E. used to clean swimming pools. Pool-grade D.E. is chemically treated and contains crystalline silica which can be a respiratory hazard. Our product is natural and unprocessed but is still not intended to be inhaled and can cause respiratory irritation if misused. For Birding: To protect birdhouses and birdbaths from unwanted parasites apply D.E. to the post and surrounding ground of your feeders and birdhouses. Simply squeeze the center of the bottle. Dust a two foot perimeter around the post; do this once a month. Do Not put D.E. directly into the birdhouses or baths, our product is intended for external use around Birdhouses and baths as a protective barrier and repellant against parasites. For Livestock: Work outdoors or ina well ventilated area. Lighlty rub a dusting of D.E. into the fur/coat of your livestock to combat (dehydrate) unwanted parasites such as lice, tics, mites and fleas. Anti-Caking for Animal Feed: Mix D.E. with dry feed at a ratio of 2% D.E. to 98% dry feed (by weight of dry feed not volume). Do not exceed this “1:50″ ratio, 1 partD.E. to 50 parts dry feed. For one (1) ton of feed mix twenty (20) Kg of D.E. (44lbs), to 2000lbs of dry feed.